NEW YORK -- Steve Weatherford was co-hosting a radio show Saturday morning when he got the phone call - and not from just any listener. The New York Jets were on the line - his cellphone - and they were offering the veteran punter a job. A few hours later, Weatherford was back with the Jets. Punter Ryan Quigley had been added to the team's injury list as questionable with an injured right shin, and New York needed someone for the game Sunday against the New England Patriots. "I'm baaaaaaack!!!!" Weatherford posted on Instagram, smiling while posing between wide receiver Eric Decker and cornerback Darrelle Revis for a photo at the Jets' facility in Florham Park, New Jersey. To make room on the roster for Weatherford, the Jets waived-injured safety Jaiquawn Jarrett, who had been listed as doubtful for the game with a knee injury. Quigley had not appeared on the Jets' injury report all week, but took a hard shot to his right leg from Washington's Jeron Johnson on a blocked punt that Rashad Ross recovered for a touchdown last Sunday. Quigley has been the Jets' punter since 2013, and is averaging 42.4 yards per kick this season with a 32.5 net average. Weatherford played for the Jets in 2009 and 2010, helping them to consecutive AFC championship games. He spent the past four seasons as a fan favorite with the Giants, and was part of the Super Bowl-winning team that beat the Patriots in February 2012. He was released by the Giants before this season and has not played since. The 32-year-old Weatherford has averaged 44.5 yards per punt, with a 37.8 net average in his career that has included stops with New Orleans, Kansas City and Jacksonville. 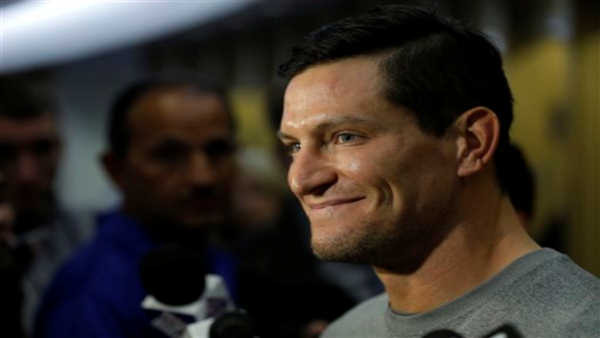 Weatherford has kept busy while not playing, frequently appearing on New York-area radio and TV sports shows as a guest or co-host. He was on 98.7 ESPN New York on Saturday with co-host Dave Rothenberg when Jets pro personnel scout Greg Nejmeh called him about the opportunity during a commercial break. He told Nejmeh he'd take the job - but then had to rush off the phone as the radio show went live again. He announced he would be signing with a team, but couldn't reveal at the time where he was heading.